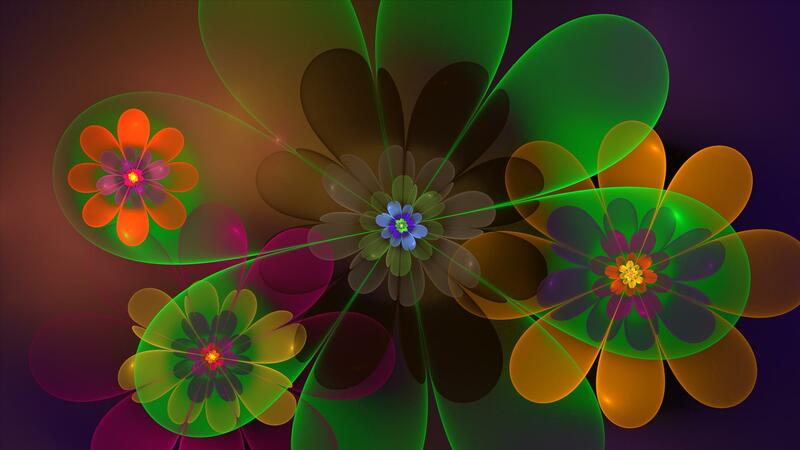 This gallery showcases some of our best fractal & mathematical pictures. Start here! We have Mandelbrot & Julia Sets, Lorenz attractors, The Burning Ship, Flame fractals, Harmonographs, Buddhabrots, Menger Sponges, Sierpinskis, 3D Fractals, Fractal Zooms, Lyapunov Fracatals, etc. Oh, and did I mention Mandelbrot Sets? We also have, or give links to, plenty of code for you programmers who want to try your hand at generating them yourselves. Fractals and harmonographs are a great way to practice and improve your coding skills! While we don’t go very deeply into any mathematics, there are some overviews for you to get a basic understanding of how fractals and other mathematical pictures are generated. In fact, the mathematics is surprisingly simple in most case, especially in the case of Mandelbrot & Julia sets. Those are generated by iterating z*z+c (complex numbers) and feeding back the result as the new value of z.
Fractal flames are a member of the iterated function system class of fractals created by Scott Draves in 1992. Draves’ open-source code was later ported into Adobe After Effects graphics software and translated into the Apophysis fractal flame editor. In mathematics, the Menger sponge is a fractal curve. It is a three-dimensional generalization of the Cantor set andSierpinski carpet. It was first described by Karl Menger in 1926, in his studies of the concept of topological dimension. The Menger sponge simultaneously exhibits an infinite surface area and zero volume. The Buddhabrot is a fractal rendering technique related to the Mandelbrot set. Its name reflects its pareidolic resemblance to classical depictions of Gautama Buddha, seated in a meditation pose with a forehead mark (tikka) and traditional topknot (ushnisha). The map is created by counting the number of times in the iterative creation algorithm a point is visited. In mathematics, an iterated function is a function X → X (that is, a function from some set X to itself) which is obtained by composing another function f : X → Xwith itself a certain number of times. The process of repeatedly applying the same function is called iteration. In this process, starting from some initial number, the result of applying a given function is fed again in the function as input, and this process is repeated. The sequence of such results is called an orbit. The Mandelbrot Set is determined by those orbits of z*z+c which don’t escape to infinity. A harmonograph is a mechanical apparatus that employs pendulums to create a geometric image. The drawings created typically are Lissajous curves, or related drawings of greater complexity. The devices, which began to appear in the mid-19th century and peaked in popularity in the 1890s, cannot be conclusively attributed to a single person, although Hugh Blackburn, a professor ofmathematics at the University of Glasgow, is commonly believed to be the official inventor.